Firestone Affinity Review: Quiet, But Not For Wet Or Snowy Roads! It is always a wise idea to look up for some information about a product on the Internet before you go all the way for the purchase. This is especially true if the item is sold online. This way, you will know exactly the pros and cons of the item. This is also true for Firestone Affinity. Even though the tire is sold as an all-season tire, it is not exactly reliable in rain and snow. So, if you are interested in the tire because of the said all-season feature, be careful! 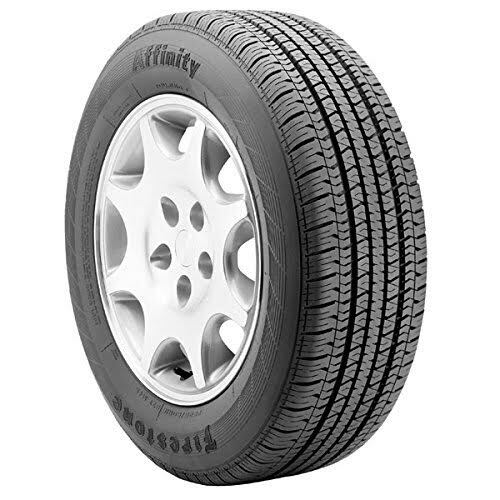 Still, if you are only driving on dry roads, Firestone Affinity can be a pretty good affordable choice. Below, you can find out more about Firestone Affinity. Continue reading! Firestone Affinity actually looks nice and stylish. It is a radial tire for touring and all-season purposes. The tread features a stylish siping pattern, with lots of diagonal and lateral sipes. The siping pattern is somewhat symmetrical, as the left part and right part are mirroring each other, separated by a center block. Such number of sipes may promote the traction, but this is apparently not the case. Firestone Affinity also features an attractive serrated band on the reverse side. The tire is made using a silica reinforced tread compound, and is supported by a polyester cord body and two high-strength steel belts. On the front side of the tire, you can find the Firestone and Affinity names written opposite to each other. Firestone Affinity is available in various sizes, so you should be able to find one that fits your car perfectly. Well, Firestone Affinity is not all that bad. It is indeed reliable and comfortable on a dry road. The best feature of the tire, besides the affordability, is certainly the very low noise level. It is very quiet, and it is able to attenuate road bumps quite well. It is comfortable to ride. Unfortunately, the claim that it is an all-season tire can be somehow misleading. Firestone Affinity is not very reliable on a wet or snowy road. The tire struggles to keep a secure traction level in rain, let alone in snow. As the effect, if you do choose a set of Firestone Affinity tires, you need to remember to drive very carefully in rain. Don’t take the risk driving in snow. The low traction can be dangerous, as it leaves your car prone to slipping. Well, the tire is quite rugged and durable, as the tire seems to hold the tread well. In the end, we don’t really recommend Firestone Affinity for an all-season, all-weather tire, but if you somehow only drive on a dry road and need a cheap set of tires, then Firestone Affinity can be the choice. Check the best price of Firestone Affinity here!